If your pond is too over grown and too much work to keep up. We would be happy to put the plants back in check and replant all that we can. We also do complete drain and rinsing as well as filtration checking and cleaning. From bare root to well potted we can trim and maintain your water garden restoring it to its original beauty. For those of you do it your selfers we have a nice list of do's and don'ts below. TIMING — with proper preparation and planning, the actual cleaning process shouldn't take long, depending on the pond size. Your most important consideration will be to work quickly and efficiently to get the fish back into the pond before they die or become overly stressed. The ideal temperature for pond cleaning is 50 to 70 degrees, with cloud cover and possibly a little moisture. Note: Do not start without set up chemicals to restart your pond. Fish, like all other animals have to breath. Displaced fish need a large surface area with shallow water. A child's wading pool, with its large surface, is one of the best holding tanks. Trashcans, as another example, are not good holding tanks. They provide a large volume of water, but only a small surface area. Without enough surface area, your fish can literally die or become severely stressed in an improper holding tank. Allow one-square foot of surface area for each 5-inches of fish in the holding tank Fish are measured from their mouth to the end of their caudal fin (tail fin). Shade is another important consideration. Your fish should be kept cool at all times. Good areas to set up a temporary pond are under a tree, 0r in a garage or patio. Depending on the temperature and water quality, the fish should not remain in the temporary pond any longer than one to two hours. If the fish begin gapping, they must be returned to the pond, or immediately aerate the temporary pond with a pump. If your pond cleaning and/ or repairing will take longer than two hours, your bathtub may be used as a fish tank. Empty and refresh 25 percent of the water twice a day using QUICKSTART as your chloramines remover. Fish may be fed while they are housed in the bathtub. Fill the temporary holding tank with about six-to-eight inches of water taken from the middle of the pond. In order to fill the holding tank, you may need to set the pump on a bucket or lily pot. The fish holding tank should be filled no sooner than 30 minutes before removing the fish. Old water tends to lose oxygen. Treat the temporary holding tank with Van Ness Quickstart (if needed), Fish Salt, and Fish Stabilizer according to directions. If you have an extra pump, set it in the tank with the outlet head 2-inches below the water surface area. Using a pump will create a mulching effect and fill the water with oxygen to help the fish breathe. Make certain the pump has a strainer so the fish won't get stuck in the inlet. Drain the pond to 2-inches of water. If your pond is large, you may want to place wet papers, cloths or large plastic garbage bags over the plants to prevent sunburn. Wet them down occasionally to keep healthy. The frequency of wetting down will depend on the temperature: the hotter it is, the more you will cool them off. This is not the time to remove old or excess foliage. Fill a 5-gallon bucket with clean pond water and place it in a shady spot for use when removing the fish. Fill the 1-gallon bucket with pond water for rinsing your snails later. Do not get in the pond unless absolutely necessary. If it should become necessary to get into the pond, wear water boots or old tennis shoes to prevent slipping. With the pond at 2-inches of water, begin catching the fish with your net, taking care not to injure them. When you spot a fish, place the front of the net on the bottom, holding it at a 45-degree angle. With your other hand, reach under the fish and carefully shove the fish into the net, making sure not to scrape the fish on the pond bottom. Place the fish into the 5-gallon bucket you filled earlier and transport to the holding tank. Use calm, easy movements and keep you voice low. Loud noises and hurried movements will frighten the fish into injuring themselves. Don't delay at this point, and don't concern yourself about the snails. Watch the fish, making sure they don't start gapping for air at the top of the holding tank. If they begin gapping, periodically mulch the water with your hands. Time is now critical for fish health. After your fish have been removed from the pond, begin removing all plants that are to be replanted to an area near the pond (cover so they retain moisture); otherwise leave them in the pond, working around them and making sure they are covered and moist at all times. Don't attempt to move the plants any great distance since they are saturated with water and may be heavy. Overgrown plants should be cut into easy-to-handle sections. If possible, two people should lift the plants out. One suggestion for removing the plants is to use a 2 x 8 plank to slide the pots up and out. Cover the plants remaining in the pond with trash bags to prevent transpiration. Based on each plant's survival time outside of the pond, remove the plants in the following order: 1) bog plants, 2) water lilies, 3) small flowering ornamentals (place in a 32- gallon trash bag for holding if the plants remain out of the pond for any length of time And 4) oxygenating grasses (collect all you can and keep them wet while they are outside the pond). With a broom and shovel, sweep and scoop the water and mud out of the pond. Don't haul the dirt away now. Not only will it be messy, but also time is of the essence and it will be easier to handle when dry. Place the dirt and water in a flowerbed or on the lawn. Nutrients from the dirt and water will help your plants, and the salts are not a problem. When most of the dirt and water are removed, take a high-pressure nozzle and spray down the sides and/or waterfall, and clean any water lines to the waterfall or fountain. Do not remove or damage the slime on the sides of your pond. The high-pressure nozzle will simply remove excess algae. Keep the slime moist during the pond cleaning. If you have hair algae that weren't removed by the spraying nozzle, use a stiff broom or a new, clean toilet brush to brush it off. Don't remove all this algae: the fish will eat the residue pieces. Rinse the pond again, leaving some of the bottom waste. The hard waste left on the bottom will help re-establish a new biological waste center. Once the pond is rinsed, begin filling with fresh water immediately. Put in the pond setup chemicals, following the setup chart shown in the Van Ness Water Garden catalog or the book Water Garden Basics. Thoroughly mix all chemicals. Be sure to use a chloramines reducer Quickstart. If you remove any leaves from the plants, look for a clear jelly of snail eggs. To save these eggs, float the leaves in the newly treated water until the eggs hatch. Begin collecting all the snails you can find from the waste you have removed from the pond. Using a net, rinse them lightly in the 1-gallon bucket of pond water. (Fresh water may have chloramines that will kill snails.) Return the snails to the pond in a corner you are not likely to step in. These snails will live for about 10 days, during which time they will lay eggs, and from these eggs will come a new group of snails. Don't trim new plants in your clean pond for at least a month, since they may shelter snail eggs. After the pond has been re-filled, begin floating the fish back into the pond. Fish can be floated back in buckets, plastic bags or trashcans. Float for 20 minutes after the pond is full. This floating process will help equalize the water temperature so as not to shock the fish. For that reason, metal buckets or trashcans are preferable over plastic. However, if you do not have metal, use plastic rather than hold up the process of getting the fish back into the pond. While your fish are acclimating to the pond, it's a good time to take a 10 to 30 minute break. Your fish are safe and the plants will hold. OXYGENATING GRASSES - Grasses must be kept wet at all times and replanted with new dirt. Rinse the grasses lightly, separating into the number of grass pots needed for your pond, using 10&emdash;15 strands 8-inches long per pot. Use one pot per 100 gallons of water. Repot with new soil unless the plants have good roots. Return these plants to the pond. If your pond becomes so green that you can't see the grasses, the algae will choke them out. 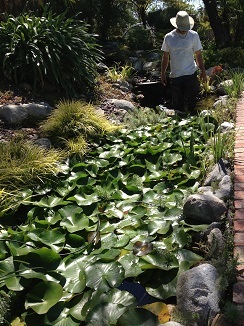 If necessary, raise the pots to within 6" of the pond surface (under the water, not out). Your fish may begin eating the grasses before they have a chance to get established. Section off the grasses temporarily with chicken wire or construct wire domes for the pots. Don't feed the fish; they'll get sufficient food from the algae. SMALL FLOWERING ORNAMENTALS - If these plants are well rooted, just trim extra foliage and place in pond. Replant if the plant is outgrowing the pot. Refer to Van Ness catalog or Water Gardening Basics for further replanting suggestions. WATER LILIES - Inspect your lilies before returning them to the pond. A 3-year old water lily will out-bloom a new plant. Flowers are the plants' means of survival. When a plant is root bound, it will start to flower. Don't devastate your pond. Most of your plants can be re-established with a little dirt and fertilizer. Note: The Van Ness fertilizer (If you're having algae growth problems in your pond and you're not using Van Ness fertilizer, you might consider using it.) Replant at least 10 percent of the pots, but no more than 50 percent. The crown of the water lily may be found where the leaves extend from the root. If the plant has no soil or crowns left, then replant because the trace elements are gone. If the plant still has a couple of crowns, tap the plant out of the pot and cut 3" to 4" of soil off the bottom. Place the proper amount of fertilizer on the bottom of the pot before replanting the lily, and then pack some soil around the roots. Cover the crown with ¼" layer of soil and place the pot in the pond. If the plant has more than three crowns, trim off the others and the remaining three will concentrate on blooming. Refer to the Van Ness catalog or the book Water Garden Basic for further replanting suggestions. BOG PLANTS - Take your shovel and cut a section 0f the bog equal to 1/3 of its pot. Place fertilizer on the bottom of the pot, put a chunk of the bog in the center, and pack the soil around it. Trim the foliage to 6-inches from the top of the pot and return the plant to the pond. Wash all the mud off the cement to prevent staining. If you leave the dirt and plant material on the lawn for about a week, it will be dry enough for easy removal. This material is excellent for gardens or planters when mixed half and half with soil. Stains can usually be removed from cement areas by using a light solution of Clorox and water about 2%. Be careful of your clothes, and be sure the Clorox doesn't get in the pond. Any stains on your hands can also be removed by using a light solution of Clorox and water, then rinse thoroughly. Don't use Clorox on wood or paint, or other products that will stain or burn plants. All of your pond cleaning could very well be wasted if you don't follow up with your pond setup chemicals. The control of algae while your plants reestablish themselves is most important. You can keep your fish healthy and save yourself a lot of grief by using Van Ness Fish Salts, Fish Stabilizer and Quickstart in your pond. Refer to the charts in the Van Ness catalog or Water Gardening Basics.